Welcome to our site! We're a Toronto-based filk trio consisting of Allison Durno, Jodi Krangle and Debbie Ridpath Ohi and have performed concerts in Germany, England, Canada and the U.S. Our songs have aired on national radio. 2013 will mark our twentieth year together as a group and as friends...how cool is that? We have won four Pegasus Awards including two for Best Performer, two for songs ("The Lady" and "My Jalapeno Man"), and were honoured to have been inducted into the Filk Hall Of Fame in 2011. Urban Tapestry was inducted into the Filk Hall Of Fame in 2011! We are deeply appreciative of this honour. 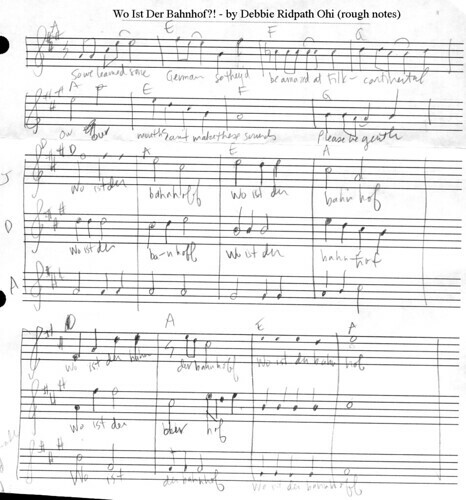 If you're not familiar with the term "filk", please see Debbie's Filk FAQ entry: What is filk? 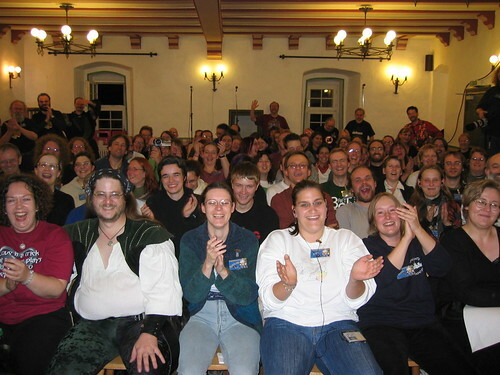 Back in 2005, Urban Tapestry was overseas Guests Of Honour at FilkContinental, one of the German filk conventions. We had a wonderful, unforgettable time. You can see my Filkcontinental photos on Flickr and Allison's photos: Part 1 - Part 2 - Part 3. And my Filkcontinental con report: Part 1 - Part 2 - Part 3 - Part 4. Then we wondered, is there lunch?